In the future, cooperative miners will be barred from contracting directly with private firms, but can form mixed business companies with, or through, COMIBOL. All new contracts must be approved by the Legislature, but will automatically be deemed effective if no action is taken within 90 days. The Legislature is expected to approve some 600 new cooperative contracts as soon as the law becomes operational. 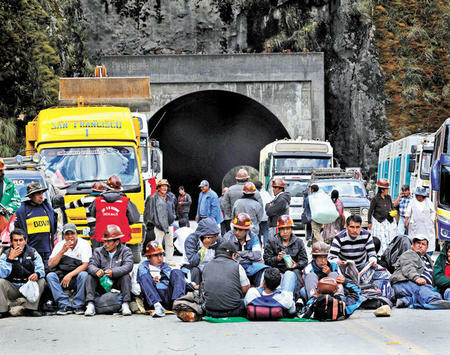 Cooperative miners' road blockade (La Razón). Bolivia’s powerful cooperative mining sector is a legacy of the 1980s, when pressure from international financial institutions and a catastrophic fall in mineral prices led to a shutdown of the government mines, displacing 25,000 salaried miners. 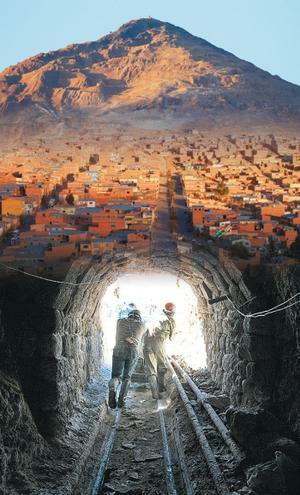 Privatization of the mines in the 1990s under neoliberal structural adjustment policies further weakened COMIBOL and destroyed Bolivia's miner-led revolutionary trade union movement, once the most combative in Latin America (and perhaps the world). 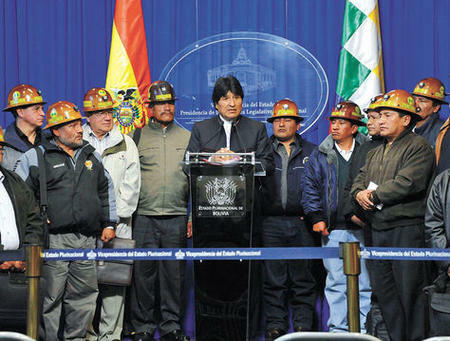 Cooperative miners reach agreement with Morales (La Razón).An estimated 75% of cooperative mineworkers do not receive health insurance or pension benefits. The sector commonly ignores health and safety laws and uses primitive extraction techniques that exploit the environment and shorten the life of the mine. Cooperative miners are exempt from paying taxes to the state (compared to 37.5% paid by the private sector, plus royalties). Historically, this privileged tax status has applied even to co-ops that associate with private companies, a practice that will terminate under the new mining law. 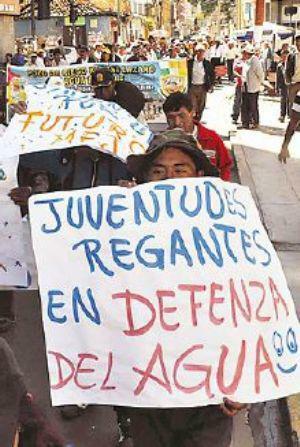 Water irrigators protest new mining law (APG). The new mining law has also been heavily criticized by grassroots organizations representing farmers, irrigators, and indigenous sectors for privatizing water rights to mining operators, restricting consultation by affected communities, and criminalizing protest activities against mining. Popular organizations like CONAMAQ, the highland indigenous people’s federation which has been at odds with Morales over mining—and extractivist policies generally—on indigenous lands, were excluded from the negotiations altogether. While irrigator groups exacted some concessions during the renegotiation, a "social summit" of 800 delegates from civil society groups has denounced the law as unconstitutional, and is demanding a referendum to develop a new, socially responsible mining code.